As summer greens fade into Autumn oranges, brilliant yellows, and crimson reds, what was hidden is revealed and what was not known becomes known. So preoccupied with the glories of long summer days and so accustomed to the green foliage that surrounds, I forget the greater beauty that awaits us in Autumn, just under the chlorophyll that sustains the leaves hanging stealthily from branches and limbs until their season is complete. We are currently in a season of waiting as we discern God’s next call for us. I’m reminded of the changing seasons, wondering what design of beauty sits just under the green of the leaves, waiting to be revealed in its time. I sweep the leaves that have fallen from the tree outside our patio. I clear the weeds from our garden boxes and leave a box filled with stunted corn, herbs that have gone to seed, a seashell brought home from the coast, and a clay flower pot we are hoping provides shelter for some of our woodland friends. Our bird feeder is filled and the squirrel has not stolen food for ages, but contentedly runs past our hollow every day, gathering nuts and food from some other source, I suppose. Meanwhile, we share life together. Making meals, taking classes, rejoicing with friends in the birth of their children, assisting some in their labors, creating and being recreated daily, and reading to our children so many books, that our eyes hurt. There are plane rides, and illnesses, dentist appointments and field trips. There is laughter and tears. There is faith and there is fear. And above all, there is God with us. Immanuel, God with us. This truth pervades everything in our existence. God is with us in our struggles. He grieves with us in our pain and sickness. He walks with us through our confusion, our trials, and our woundedness. He knows what it is like to walk in this broken world filled with misunderstandings, rejection, and no home to call his own. He is familiar with it all and understands more than we can comprehend. Yet, he did not set out to prove himself. He faithfully walked in His calling and entrusted Himself to the Father. He didn’t deny His own grief, but let the tears bleed red upon the ground He created. Jesus remained faithful to the Call. And for the joy that was set before Him, He continued to walk into all that the Father had for Him to do. So, for the joy set before us, we wake up to a new day, seeking to live faithfully in this waiting, as we complete the next seven months of our current season. Watching the leaves fall off the trees and become barren, we are reminded of the shedding of former seasons. With the certain hope of spring, we’re reminded of how God is forming us for a new work, one that is yet unknown, unseen. Like new buds, and fresh growth ready to appear in its time, it will surely come. What I’ve learned about seasons is that you cannot rush them or force them to change as much as wearing my Fall sweaters doesn’t cause the temperatures to cool down and wearing my rain boots won’t bring one single drop of water from the clear blue mid-western skies. Our garden boxes are cleared now. They are ready for the cold, the rain, and the promised snowfalls of the approaching winter. The weather has cooled and it rains outside my window in the dark of night as the children fall asleep. A baby was born last week and one is due shortly. There are meals to prepare, requests for prayer, and fellowship shared. There are applications and evaluation forms to fill out, job opportunities to consider. There are bikes to be ridden and books to be savored, Lego to build and laundry to fold. There is laughter and tears. There is faith and there is fear. But above all, there is God with us… Immanuel. This is the truest truth that speeds the darkness away and brings shalom to my soul, for it is a peace that is eternal. ‘Behold, the virgin shall conceive and bear a son, and they shall call his name Immanuel’ (which means, God with us). About four years ago, my dear friend, Thea, and her family came to visit us in the desert valley of central Washington. Our children enjoyed the reunion of friendship and fun, playing in their toddler ways, enjoying the nearby old city park and playground, and, us parents, enjoyed the familiarity of good and true conversation about all sorts of things. And whether they were deep theological thoughts, recollections of days gone by, or the tantalizing sharing of book titles and wine, we were content and happy. On a visit to the nearby Franklin Park, sitting on the grass, my friend shared with me something that had been on her heart. “Hey Jen, so… I started a new blog!” Now, to rewind the cassette tape just a few years, my friend and I both love to write, we’ve both had several blogs already, trying our hand at social media, the ups and downs of what we are really after in our writing, and the constant submission to the Lord as He develops our respective writing habits. Little did we know, we would one day share space in Deeply Rooted Magazine together, and that has been one of the sweetest fruits of our labors together, thus far. Visiting her new blog, a children’s book review website, I saw the familiar favorites listed in her beginning posts, the likes of Winnie-the-Pooh and The Chronicles of Narnia! Delightful, engaging, and inspiring. Over the years, I have shared her blog with many others. Isn’t it great when you can trust someone’s recommendation of a certain book, and because they say its wonderful, it gives you the confidence to try it out for yourself? Below is a brief interview with my friend, Thea, because I would love to introduce you to her. So sit back with your cup of tea or coffee and see what beautiful things may come! Thea, thank you for being willing to join in this interview! I know you have had several interviews in the past, mostly for your years in music, so this might be a blast from the past! But this time, it is about books, stories, and the One big story it all points to. To start out, what is the background story behind the title of your blog, Little Book, Big Story and what inspired you to begin this work? Thank you, Jen! I am so grateful for our cross-country, almost decade-long(!) friendship, and I love reading your beautiful blog posts. It’s a treat to have the chance to visit with your readers (who are, I suspect, kindred spirits). I have always loved reading children’s books and started building a library for our family when our oldest daughter was a baby. I wanted beautiful books—well-written and creatively illustrated by artists striving to glorify God—but what I found, instead, was that many Christian books had a lukewarm quality to them: too-cute rhymes, bland illustrations, and no Gospel. Reading those books to my daughter was like trying to drink tepid lemonade: I could do it, but it didn’t satisfy. By the time I started my blog, we had two more daughters and a library that spilled into every room of our house. The blog became a sort of vent for my enthusiasm—a way to share our favorite books with everyone, all at once. The name Little Book, Big Story came from the idea that these “little,” underestimated picture books written for “little,” sometimes overlooked people often convey the big story of the Gospel with a simplicity and clarity that can be hard to find in books written for grown-ups. When did you become a reader, or book lover, and which books whetted your appetite in those early years as a child and young reader? I read a lot as a child, but I remember only a handful of books that shaped me in a favorable way: A Wrinkle in Time. Matilda. The Best Christmas Pageant Ever. I’m sure there were others that I’ve since forgotten. But when I was in college, I started collecting books to read after graduation (when I would be a free woman, able to assign my own reading list!). I found myself accumulating lots and lots of classics, because—despite majoring in creative writing—I just wasn’t being assigned them in school. David Sedaris: yes. Dostoevsky: alas! No. What are you looking for when setting out to find new titles to review? I love this question! Because I only review books that I absolutely love on my blog, my criteria for what gets a review and what doesn’t is pretty subjective. I look for moments of truth in a story, moments that hit the string in my heart that rings with the Gospel. I look for beauty and for originality, too, in the way a book was written, illustrated, and constructed. I look for books by Christian authors, because I want to save families the work of reading those “tepid lemonade” books and guide them, like a trusty librarian, to true and beautiful Christian books. But many of the books I review are not explicitly Christian in content. These books may present a clear picture of a character loving the outcast at a great cost, or of a character reaching the end of his own strength and appealing for outside help. Or they may just be so delightful that I must share them. When I choose titles to feature on my blog, my hope is that each one will help families build the sort of library that nurtures, in children and parents alike, a love of the Great Author. Which children’s book author has become your favorite and why? Sally Lloyd-Jones. There are many truly gifted authors out there, but I say Sally Lloyd-Jones without hesitation because she writes to kids with humor (but no cuteness), grace (but no mush), and honesty (but no cynicism). She clearly respects the kids she writes for, and she writes wonderful, Gospel-rich stories. You list various age categories for books on your website, if you could pick, which is your favorite age-related book category and why? I love middle-grade novels (typically for readers ages 8-11). I read them on my own for years before I had kids, so many of my own favorite books fall in this window (A Wrinkle in Time, Anne of Green Gables, The Chronicles of Narnia). When my oldest daughter reached this age and we were able to start reading these books together, it was a big moment for me. What is currently on your “night stand”, literally or figuratively? I remember in one of your blog posts, you wrote about the need to find time to read. 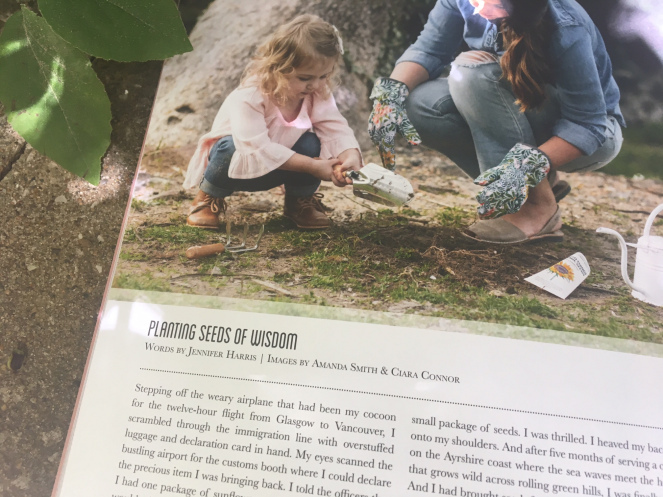 At times, you read while cooking, or out in the yard while the kids are playing or early in the morning. As a mother of four children too, I know how intentional one has to be to carve out time to pursue habits such as reading, music, crafts, or even exercise. How has your reading time developed over the years and how do you fit that into your daily life? Even before having kids, I read at bus stops and in waiting rooms—I’ve always been an opportunistic reader. These days, it is harder for me to find time to get lost in a story or follow a book’s complex argument, but we have instituted a whole-family quiet time in the afternoons while our youngest daughters nap. That is often (but not always!) my chance to sit out on the front porch and read, underline, and mark passages in my notebook. When can we expect to see one of your own stories in print? I fully expect to be purchasing children’s books by Thea Rosenburg one day! Ha! I would love to write books for children. As I’m sure you can imagine, I’m not in a stage to pursue that right now, but I do scribble on scraps of paper and paint tiny paintings and read a lot of great books in the hope that, if that’s something God calls me to as my children grow older, I’ll be ready! The waves lapped calmly toward the shore as the young man hovered above the water, putting one foot in front of the other on the slackline. Captivated by curiosity, onlookers paused in their stroll along the boardwalk that hugged the shoreline of the bay. As we watched from a distance, hoping for his successful crossing, yet humorously knowing a short fall and a refreshing splash could be the outcome, we watched as he artfully traversed the line, swaying in the air, and at long last, the pull of gravity, a slight wind, and a misplaced step brought him into the salty ocean water. Balance is something we strive for in our fast-paced society. Self-help books line the shelves of shops and offer us hope for finding the perfect way to schedule and orient our daily activities so we can accomplish more, utilize our time more efficiently, and help us to produce maximum output at minimal stress, the perfect balance of work, play and rest. But balance never seems to come, as if it were some illusory and unattainable goal. One of my husband’s seminary professors recently challenged his students that perhaps balance is a myth. It is widely held that balance is something we can achieve and is necessary for our health and well-being. But could it be that if we are always seeking this and never finding it, that perhaps it is a false idea. It is so ingrained in our society, that to think of not pursuing balance seems ludicrous. Perhaps we are not meant to pursue balance, but instead to pursue faithfulness. When the young man was attempting to cross the slackline, he was seeking balance, yet never finding it. He was teetering to the left and to the right the entire way. Trying to resist a sudden gust of wind, or pulling away from the gravity that sought to bring him down, he shook and swayed and kept moving forward because to stop would cause a certain fall. And fall, he did, never achieving balance if but for half a second. Though he inevitably fell off the line, he seemed to enjoy the water in the cool of the summer evening, cheers went up and he got right back on the line to try again. His commitment to practicing and moving forward was what got him across and accomplishing his goal. As I plan out the various aspects of my role as a Christian, wife, mother, church worker, homemaker, birth doula, writer, and whatever other roles I take on, I am realizing that balance might just be a myth. As we try to order and prioritize our responsibilities, we need to seek faithfulness instead of balance. When I have a sick child at home, I may not be able to serve in Sunday School that day, but care for my child at home. When a client calls me to a birth, I may need to stop cooking a meal, call a friend to watch my kids while I run to assist a woman in labor. If my child is successfully taking a nap, and all is well in my home, I may be able to carve out 30 minutes to write an article for a non-profit ministry that I serve. But if my child wakes up early and my plans are interrupted, I need to close my computer, put down my book, stop writing my grocery list, or leave a bathroom half cleaned, and pull that little one onto my lap for a story, and refocus my attention on this dear one. Often I feel the gravity pulling me in more than one direction. In that moment, I need to set my eyes on Christ, take a deep breath and ask the Lord how to put one foot in front of the other, allowing myself the freedom to sway and shake, but faithfully moving forward, putting the most important things first, and letting everything else fall into place in their time. At times, I may take a misstep, and fall unabashedly into the water below. But hopefully, I will surface with a laugh, a shake of the head and keep moving forward with one foot steadily in front of the other, seeking not balance, but faithfulness. Stepping off the weary airplane that had been my cocoon for the twelve-hour flight from Glasgow to Vancouver, I scrambled through the immigration line with overstuffed luggage and declaration card in hand. My eyes scanned the bustling airport for the customs booth where I could declare the precious item I was bringing back. I told the officers that I had one package of sunflower seeds from Scotland, but it would take a while for me to find them in my luggage. I knew my parents would be waiting for me just through the double doors. It was hard to leave my home away from home that I had grown to love, but I was eager to see them and settle back into the familiar. At long last, the officers said I could keep my small package of seeds. I was thrilled. I heaved my backpack onto my shoulders. And after five months of serving a church on the Ayrshire coast where the sea waves meet the heather that grows wild across rolling green hills, I was finally home. And I had brought seeds for planting. I still remember one of the first songs I wrote as a young child… it had something to do with rainbows and a suitcase, I think. Stories about Ricky Raccoon and his woodland friends are still tucked away in a box somewhere. With a love for words, story, poetry and song, I have always loved to write. This past winter, one of my friends who also loves words and language and is by far, in my opinion, one of the greatest writers I have personally ever read and who inspires me with every piece she composes, asked me if I’d like to contribute a piece to the magazine for which she is editor. Now if that’s not a run-on sentence, I don’t know what is. So I’d like to introduce those who are so gracious to read my essays (blog posts), to my dear friend, Thea at Little Book, Big Story. She is also my personal editor! It was a joy to receive her invitation and I may have done a happy dance, as we writers like to call it! I set to work this past winter to write a piece on planting seeds of wisdom in our children’s hearts. My husband helped me to carve time into our winter break here at seminary. With my favorite chocolate and wine in hand, candles lit, and a soundtrack of ocean waves to get me into the mindset of preparing this little article, I set to work. When we talk about planting “seeds” of wisdom in children, we are dealing with beginnings, a genesis of sorts. Seeds simply have the potential and the capacity for growth. They are not the end result. These seeds need to be given an environment in which to thrive so that they can grow into maturity. I am not a perfect parent, and I am not at all the wisest amongst women. I am faced by my brokenness and need for Jesus every day. It is why I pray for new mercy every morning, that I may live a life that is faithful and honoring to Christ, that gives Him glory and brings Him delight. But God does not wait for His children to arrive at a super-spiritual, incredibly wise point in our lives before He starts to use us. He simply desires for us to be willing to be used and He takes us as we are in our weakness, and then uses us the way He desires. He touches the lives He wants to touch with our willingness to serve Him, and then gives us sheer joy in being used by Him, every day, in big ways and small ways. Undergirding all our efforts to be faithful to God’s command to train up our children in his holy ways, we must de- pend upon the Holy Spirit and be diligent in prayer. It is on our knees in prayer where the most work is done. Years ago, when our children were babies and toddlers, a friend told me of how there were many nights when she would stay awake in prayer, interceding for the souls of her children. That has stayed with me all these years and through many sleepless nights, I have asked the Lord to work mightily in the hearts of my children. Just like the man in Luke 11:5–8 who persistently knocks on his friend’s door in the middle of the night, asking for bread, God wants us to be persistent in prayer. It was a joy to write this piece and to share a bit of what I’ve learned in these early years of parenting, things I’ve learned from God’s Word, from my parents, from friends, and authors of long ago. To read the rest of the article, you can pick up a copy of Deeply Rooted Magazine in two ways, either a hard copy of the magazine which reads like a coffee table book with beautifully designed layouts on thick matte paper, a collection of readings and inspiration to point you and others to Christ, or you can purchase the digital copy. 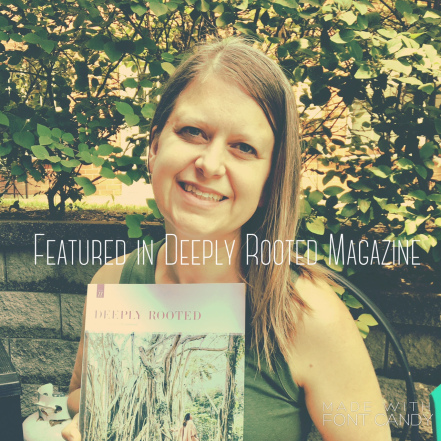 Deeply Rooted Magazine exists to glorify God in womanhood. Thank you, Thea Rosenburg and Dianne Jago for this opportunity! Spring has emerged these last few weeks and what a flurry of activity has begun outside our patio doors. The cardinals, red-breasted robins, and chickadees are joining us again at our Woodland Hollow. Blossoms unfold and are whisked away by spring winds and rain. Chipmunks and squirrels once again climb the pole of my bird-feeder to steal away the seeds I’ve placed for the birds. And so, the battle between Mommy and the squirrels begins again as seed gets scattered, gluttonous squirrels get chased away, and Crisco gets smeared on the pole to hold them back for another day. Along with Spring, Holy Week has arrived; a holiday that calls for remembrance, solemnity, preparation, celebration and feasting! This is our favorite time of year and we love to celebrate in meaningful ways. We enjoy celebrating Lent, to focus our attention for a period of time on praying for something specific, perhaps fasting from something to bring my attention to more focused prayer, with readings and even kids’ activities. This is our ideal, although reality often looks a lot different. This did not happen this year. I had full intentions to go through a reading plan with the kids, but I didn’t even get to the point of printing it off my computer. Sometimes life is like that. And perhaps for some of us, life is often like that! If you are like me this year, with lack of energy, preparation, and time (for the Lord has placed many things on our plates this year), then may I be completely honest and share that we are starting our Lent reading plan today, on Day 37. That’s right! We missed the first 36 days and we are opening our Jesus Storybook Bible today to prepare for Good Friday and Resurrection Sunday using Sally Lloyd-Jones’ free lent reading plan. Sally Lloyd-Jones is the author of the Jesus Storybook Bible: Every Story Whispers His Name. This year marks the 10th anniversary of this beloved story Bible that takes the truth of Scripture and presents Bible stories in a way that connects with children, and even adults! Our daughter was just a wee baby when I first heard of this book. When a friend shared that she, herself, was deeply impacted every time she read one of these stories to her children, I decided to check it out! Its been a part of our family now since our daughter’s first birthday. By the wear and tear of it, you can see how well loved it has been. In fact, this Easter, I decided to purchase a new copy for our family to enjoy! As well, for Lent and Easter, Sally lovingly put together this reading plan to help parents walk their children through this most meaningful season in the Church calendar using The Jesus Storybook Bible and the corresponding Scripture passages. Perhaps next year, the blossoms will stay a while longer on the bushes before the wind sweeps them away. Perhaps next Spring, the squirrels will be a bit more generous and leave more seed for the birds. And, perhaps, next year, we will start our Lent reading plan from the very beginning, on Day 1! Happy Easter! Our Rescuer has come and is alive forevermore! Almost eight years ago, my husband, myself, and our baby girl were planning an international move… 45 mins from home! As we prepared for my permanent resident interview, including a short, and very sweet, trip to Montreal, Quebec to become a legal immigrant, I began praying for the friendships I would make in our new hometown. Though I was excited and eager for yet another adventure that God was calling us to, I was sad to be separated from dear, life-giving friendships that had been established and nurtured through regular three-hour-long coffee dates every other week. It was so hard to leave these friendships that began during my single years, supported me in early marriage, walking through the grief of miscarriage, and rejoicing with me in the joys of life with a long-awaited newborn. Even though I was moving a mere 45 mins away, I couldn’t bear not to have these ladies by my side, or just down the road! But that separation of a border and another country made it seem that much further away! Thankfully, those friends came and visited once or twice a month and I was able to go and visit as often as I could as well. We found a favorite coffee place in my new hometown, a new favorite walking path along the bay and, thankfully, we were able to keep up our friendships in this new season of life, stateside! As time went on though, and as we got more settled in our town and in a new church, I knew I had to start making deep friendships there too. So I started to pray for an “American Lisa” and an “American Karen”. That God would bless me with deep friendships in our new town that were as deep and life-giving as those I had in Canada. And, through time, playdates, and mutual initiation, those friendships did come and continue to this day as well. We know that when we do get together and see each other again, we will be able to step into that closeness and like-minded friendship and conversation again. I know that these women are my sisters in Christ, they rejoice when I rejoice and mourn when I mourn. And I do the same for them. We are each other’s cheerleaders and prayer warriors and will be throughout the span of our lifetime. I’m thankful for these friendships. They are lifelines that point me to Christ and I need them. I’ve written before about how I’ve needed to hold my friendships with open hands as God has called me to a nomadic life of serving Him in various locations. Perhaps this is why I’ve put much thought and prayer into my friendships over the years, as I know that I need community wherever God calls me, and now us, as a family. We have at least one more move before we settle down for hopefully what will be the place where we settle and put down roots for the foreseeable future, perhaps ten, twenty years or so. I’m starting to pray again for those friendships, the women who will be in my circle, serving with me, praying with me, and loving our community together for Christ. Perhaps it is quite timely then, that God led me to read Christine Hoover’s new book, Messy Beautiful Friendship: Finding and Nurturing Deep and Lasting Relationships. As I flip through the book, it is looking rather yellow! I have marked it up quite thoroughly with my yellow highlighter. Reading so many thoughts and ideas that have echoed my own through the years was like finding a kindred friend who knew exactly what I was thinking! Something awakens in us when we find someone who can relate to a shared value, struggle, or lesson learned. That is what I found when reading Messy Beautiful Friendship. The book is laid out in short, concise chapters, much like a devotional book, focusing on specific themes. Each of the five sections leads the reader through a pilgrimage of facing the very real challenges of friendship while leading the reader on to a gospel-centered perspective on friendship that reflects how we are to live in community as Christians. Far from a worldly, static perspective on friendship, Christine offers water for the parched soul that is longing for friendship that goes beyond mere surface talk, common interests, and vacationing together. Interspersed along the way are quotes from Dietrich Bonhoeffer’s book, Life Together. I love it when authors find an old, Christian classic like this and weave the wisdom of those from another time and place into a message that is meant for our generation today. It not only reinforces what God was doing in a community from a culture and political climate of years gone by, but also shows that what God was doing then, is what He is continuing to do today, bringing the redemptive power of His Son to a hurting, broken world, a world that He will one day make new. We need the messages that are written for today as well as those words, sometimes ancient words, that connect us to times past. Throughout the book, Christine unravels many of the reasons our friendships get so messy. It is that unspoken wish-dream of friendship that hinders so many of our relationships and prevents us from embracing the people who are right in front of us. Our idealistic expectations for community get shattered every time we put that wish-dream on its pedestal. She delves further into why its so important to enter into that messiness to find the beauty of friendship on the other side of our “ashes of insecurity”. A wake up call like a back draft from an inferno rushes through my heart as I read those words and remember the times I’ve silently held back my offer of rejoicing with another in her joys, as well as the pain I have felt in my own heart when others have not rejoiced with me in my blessings. We all struggle in this way. Our insecurity breathes its venom from silent smiles when we choose the ways of the world, instead of following the Lord in his outpouring of a life of sacrificial love, obedience, and service. Our eyes need to be ever on our Lord, drawing strength from the Holy Spirit to actively listen, celebrate, and rejoice with others. Slowly, our insecurities fade away like the deadness of winter being engulfed in the new life of spring foliage. Our friendships become fruitful and life-giving to others and we find the safety of a community that lives and breathes the gospel of grace. As I mentioned, my book is filled with yellow highlighting. I could write many reflections, perhaps on each chapter, as I have read this book. I will leave you with one more quote from Christine as she challenges us to enter into the hard conversations and the messiness, while seeking God’s glory and our joy in the beauty of friendship. As part of Christine’s launch team for this book, I invite you to visit her book launch page, order the book before its release date next week for a sweet deal, and get those preorder goodies before they’re gone! You can purchase her book on Amazon! It was midnight when we rolled into the driveway of a city hotel under the cover of pitch darkness and a brooding storm that had escorted us into our new state, half way across the country. For months as we were planning to move, I couldn’t envision this new place and so in my mind, the state of Missouri was completely dark. And when we arrived to our hotel where we’d be living for a week as our new apartment was being prepared, I opened the handle of the driver’s side door into blackness which was lightened only by the hotel’s inner brightness and some funky pop music to usher me out of my stressed out, post traumatic state of having driven for about 15 hours straight, the last few hours having been pummeled by a thunder and lightning storm. Darkness. What I had envisioned about this state was still true in my perception. Our family was alone, isolated, with no friends or family, and without a clue as to what we would wake up to in the morning. The morning did come. We awoke to blue, sunny skies overlooking a city, although all I could see from our hotel room was trees for miles. Trees! Now I knew two things about Missouri… storms and trees! The light was beginning to dawn on the beauty of the new land we had come to and our perception of this amazing state was getting into focus. As we bravely left our hotel room to visit the campus, we were met by strangers who would become dear friends and neighbors. We were met by introductions, small talk, and “what’s your phone number? I’ll give you a call and we’ll get together!” More light was coming into view and our vision of what our home could be for the next three years started to become clearer. In fact, there was one woman on campus, Liz, who had been silently preparing for my arrival for several months and when we finally met in person, she was like a magnet that drew me in and connected me with other women, giving me much to look forward to in friendships here and what God might do in the life of our family here. The truth of the matter is that we all have the ability to be friend-magnets when we enter a room with the words, intentions, and body language of seeing others–There you are!–rather than saying Here I am! Everyone look at me! Everyone listen to me! or the opposite, false humility response, I hope no one notices me. I will feel too self-conscious. We esteem others as more important than ourselves. We keep an eye out for the one standing on the fringe of the circle. We move toward the outside and pull those we find there into the mix. And let’s face it: Don’t we all feel like we live on the fringes in some capacity? Haven’t we all felt like an outsider at some point? We all know the relief of someone pulling us from the outside to the inside. We’ll be their friends for life. In fact, I’m pretty sure my dear friend did say those exact words several times, “There you are!” She was so outward-focused and so eager to serve and connect me to the community that she invited me and our four kids out to the zoo with her and her kids while still living at the hotel that first week! We weren’t even in our new place yet. After that, she sent her older sons to collapse all our moving boxes that were strewn about on our patio. She sent food, invited us for dinner, play dates, and since then, many more coffee dates! Keep an eye out for the marginalized, the fringe, the new, the lonely, the quiet and unsure ones. Your influence pointed in the direction of an outsider can have great impact. It doesn’t take much—a word of welcome, an invitation to a playdate, a thoughtful encouragement about a job well-done, or remembering her name—and a whole new world opens up for the one who needs a world, any world, to open up. I’m so thankful for this friend who reached out to me during a time of great need, even before I stepped onto the campus of our new home away from home. It meant the world to me! With the stability of a growing friendship with her, I was then able to, slowly, reach out to other women here and begin to offer the same kind of friendship I had received from her, to them. I am a part of Christine Hoover’s launch team for her new book, Messy Beautiful Friendship. One of my favorite things to do is to share great Christian resources with other women, as well as promote or share the creative work of other women as they use their divinely designed gifts to serve God and the Church. It is an honor to pair these two loves into helping promote her new book which will be released on April 18th. Below, you will find one of these excerpts. Enjoy, and be blessed in the gift of friendship! Perhaps you’re one of those people with friends coming out the wazoo. I am friends with people like you. You are likable, fun, considerate, helpful, and all-around good human beings. You are awesome. I flock to you. These friends of mine, upon hearing that I was writing a book on friendship, asked me to tackle these questions: How does one foster intimate, true friendships and remain hospitable without becoming cliquish? Is it even healthy to cut off the number of friendships you have? The friends that I mention are women using their influence to serve others, honor others, seek out the best interest of others, and love others in a way that brings glory to the Lord. For those who are jealous of the friend-magnets in your midst, to be fair, I don’t think it’s as cut and dried as it seems. I believe these women are a real-life chicken/egg scenario: do people come toward friend-magnets simply because of who they are, or do these friend-magnets consistently go toward others ready to bless and honor? I see my friend-magnet friends working hard at friendship and being extremely others-centered. They are genuinely interested in others, honor others, and listen to others. My friend-magnet friends all have wildly different personalities, so it’s not that they have a charisma necessarily, although I think they are delightful people. They are simply people who consistently go toward others, no matter who they are, and seek to make other women feel comfortable. If you are a person who attracts friends easily, please know that you’ve been given a gift from the Lord. You’ve been granted a magnetism and a way of making people feel loved. Thank Him for this gift, but please also recognize that this gift is not about you. The gift you’ve been given is the gift of influence, and it’s important to consider how you will use it. If you are a woman who attracts friends easily, my encouragement to you is to use your influence to serve the outsiders. Keep an eye out for the marginalized, the fringe, the new, the lonely, the quiet and unsure ones. Your influence pointed in the direction of an outsider can have great impact. It doesn’t take much—a word of welcome, an invitation to a playdate, a thoughtful encouragement about a job well-done, or remembering her name—and a whole new world opens up for the one who needs a world, any world, to open up. The truth of the matter is that we all have the ability to be friend-magnets when we enter a room with the words, intentions, and body language of seeing others–Thereyou are!–rather than saying Here I am! Everyone look at me! Everyone listen to me! or the opposite, false humility response, I hope no one notices me. I will feel too self-conscious. We esteem others as more important than ourselves. We keep an eye out for the one standing on the fringe of the circle. We move toward the outside and pull those we find there into the mix. And let’s face it: Don’t we all feel like we live on the fringes in some capacity? Haven’t we all felt like an outsider at some point? We all know the relief of someone pulling us from the outside to the inside. We’ll be their friends for life. An honoring person who looks for the outsider soon becomes a safe person for many, many women. In other words, her opportunities for friendship are abundant and overflowing. This is why my people-magnet friends are asking, “How does one foster intimate, true friendships and remain hospitable without becoming cliquish?” and “Is it even healthy to cut off the number of friendships you have?” Because a person who honors others will eventually have to navigate these things. And I say, in response, that part of honoring others is connecting others. There is a special kind of joy in connecting two women we think will hit off or who share a story, interest, or life circumstance in common. We don’t have to be everyone’s bestie, and just because we’ve included someone doesn’t mean we have to become their intimate friend. We can help foster community among women by being a bridge between them. So, for my darling friends who are worried about having too many BFFs to handle, this is what I would say: honor all and be deep friends with some. Be friendly and hospitable to all and give intimate attention to a few. Welcome all. Keep an eye out for all. Love all. You don’t have to be close friends with everyone, but you can certainly use your God-given influence to bless others and connect women with one another. Be a friend magnet and you’ll attract joy too. To preorder Christine’s new book, click here! As well, watch this wonderful interview with Ruth Chou Simons of Gracelaced.com. In it, Christine and Ruth talk about overcoming hurts in friendship. This 30 minute video is packed full of godly, Biblical wisdom and truth. Almost two years ago, we packed up our home and moved our family across the country to attend seminary. We said goodbye to dear family and friends. Many of those friendships having just been made three years previous. Having moved many times in my life, I have known this pattern, this rhythm of reaching out and letting go; the ebb and flow of changing relationships and life stages. With a mix of embracing the next thing that God had for us to do, with a sense of adventure for what lay ahead, and with the knowledge that my heart would grieve again as we said good bye to everything and everyone familiar, the Lord had taught me how to sustain and maintain long distance friendships while starting new friendships in a new location. It was challenging to walk through the emotional work of discerning where each new and old friendship fit into my heart and life. As a married couple and as a family, we have lived in four different cities in the past 10 years. Each location being substantially far from the last one. I have invested much emotional energy into developing new friendships and have learned several things that have aided me in maintaining my treasured and valued old friendships, while taking the risk, time and energy of investing in the much needed new ones as well. Years of prayer have been put into the health and strength of friendships. Whenever we have anticipated moving, I have prayed in advance that God would bring into my life a few really good friends. He always does! I pray for Him to direct my path to kindred hearts and allow the friendships to develop in God’s time. Praying and then trusting God to provide is an active discipline of faith. Sometimes the friendships have come quite quickly. At other times, I have had to wait a couple years before I saw the fruit of my prayers as I’ve actively reached out in my pursuit of community. In one season of life, the loneliness was almost too much to bear as the pursuit of friendship took much longer than anticipated. It was at that point that God provided a lovely and unexpected friendship with a much older sister in Christ. Though she was thirty years older than me, the depth of friendship I experienced with her was honest and real. At times, through tears, I would share with her my friendship struggles, and my heart was ministered to in the counsel and empathy I received from her. Never think that your friendships have to be only with peers who are the same age. Some of my deepest friendships have been with ladies who are either much younger or much older than I. We are sisters in Christ and we can learn from one another. To enjoy the fruit of deep friendships, you must put in the work to cultivate those relationships. Its a journey of intentionally seeking to know someone else, as well as becoming known. That journey begins with knowing yourself first. Realizing my personality type has given me an understanding of how I work in friendships, what I need, and my limitations in friendship. I am an introvert, meaning I recharge when I have alone time, to pray, read, write, decorate our home, play music, sew, bake, dream and rest. This is how I create a calm in my soul and how I refuel for the times when I do go out and fellowship with others. I plan playdates a week in advance so that I can structure my day or week to allow for a renewal of energy. As an introvert, I have to say no to many other opportunities so that I can stay healthy for my family. As well, I struggle with anxiety. As an introvert, this makes me even more introverted at times. Thankfully, those who know me well understand this about me and support me in the boundaries I need to stay healthy. When a friend takes an interest in my family, writing, music, or my work as a birth doula, I feel that I have truly found someone who cares for me as a person and the way God has designed me. We feel loved by those who seek to know us. Knowing who you are, your limits and boundaries and what you can give to a relationship is key. Old friendships are a treasure and have a history with one another that spans years, and even continues to grow in new ways over the years if they are maintained in even just a little way, every once in a while. These friendships become the thread that tie our stories together from one chapter to the next. Every once in a while, I send a long email to a friend, or a hand-written postcard and occasionally we have a video call. It is so good to catch up personally with each other, knowing that each of us has taken the time to reach out, spend time thinking about what is going on in the other’s life, and sending words of encouragement. Personal letters are a wonderful way to maintain the treasures of old friendships. I want to write more hand-written letters as well. In an age of much online communication, hand-written paper letters become a treasured keepsake or memento, tucked away in a box or basket for years to come. It takes intentional work to keep in contact with those back “home” whether friends or family. Two of our dear friends have now moved to Asia, several are in the Northwest and still more in Canada. How can you keep in touch and maintain that closeness with people you hold so dear with the hindrances of distance and time? It can still be achieved. Though we are thousands of miles apart and though its not quite the same as living in proximity to each other, we feel strengthened by friendships that have stood the test of time. And when we finally do see each other, we can simply pick up from that last communication and continue the conversation. Each place we have lived in the last 10 years has accommodated starting new friendships at different speeds! Having just one baby and then two, allowed me to have a couple playdates a week. Our weekly schedule included Bible study nights, women’s ministry, family nights, and hosting people for dinner. But having a couple mornings where I could connect with another mom either one on one or at our church playgroup helped fill me up with meaningful conversation and like-minded friends. Our third child was 3 weeks old when we moved to a new city far away. I was busier, adjusting to a new environment, preparing to homeschool, unpacking moving boxes, getting to know new grocery stores and amenities in our city, and focused on the busy schedule of caring for my two toddlers and a newborn. Investing in new friendships took a lot longer, but eventually, the friendships did come! A year ago, we moved clear across the country to attend seminary. Because of our living situation, several friendships took off at lightning speed and a sense of belonging came much more easily. Perhaps because many of us live in or near the same building and daily borrow recipe ingredients, babysit each other’s children and hang out at the communal playground! We needed quick and deep friendships knowing that we would only be here for three years. But friendships still take time and with four little ones in our family now, my time is more limited, especially since my husband is taking classes full time and working several part time jobs. My limitations are at the greatest they’ve ever been so I am thankful for the playdates I do have, the coffee dates that get jotted on the calendar 1-2 weeks in advance and the little snapshots of conversation I have at the playground with other moms or the 8am morning knocks on my door requesting coffee! These are my seminary sisters and this unique season of life is one I will cherish forever. When moving to a new city or pursuing new friendships, it is easy to get consumed with my own needs for friendship and to put self at the center of relationships. When I’m tempted to do this, the Lord reminds me to put Him first, to love Him and love others. In elementary school, there came a time when I was struggling with loneliness. I confided in my mother that I didn’t feel like I had many friends in my class. One of the greatest pieces of advice she gave me regarding friendship was to go and look for the people who had no friends, those who were lonely too, or new to the school and befriend them! So from that point on, that’s what I did. I didn’t realize it at the time, but it was a way to serve Christ and serve them. God brought increased joy to me in this new mindset and I was able to live with hands held open regarding friendships, whether they continued on or faded with time. The biggest thing for me to remember is to entrust my friendships and need for community to God. He knows we need community and supportive relationships. He is our Good Shepherd and our Provider. Life lived in community as the people of God, reaching out together to a world in need of His love is even more important to Him than it is to us. As we have just over a year left at seminary, our hearts and minds are looking towards the next giant step of faith we must take. All the decisions and work that needs to be done before that are like stepping stones. I am already praying for the friendships we will have in our new location, new ministry, and new city. At the end of our seminary journey, we will know many more like-minded friends who will be dispersed to different corners of the country and the world. We will, again, walk through the emotional work of discerning where each new and old friendship will fit into our hearts and lives. Friendship is a gift but it is also an endeavor requiring much effort, grace, and service. In Christian friendship we find that it is not so much about fulfilling our own needs to be known, but to serve others in knowing them, a laying down of our lives for our friends. In laying down our lives for another in humility and service, it is there that we model the friendship of Jesus. In Him, we find the strength to bravely reach out with hands held open.